The Audio Precision AUX-0025 / 0040 / 0100 switching amplifier measurement filters are designed to be inserted between the device under test and an analyzer input, to reduce out-of-band switching signal components before measurement. The filters use a passive design for optimal performance, with custom inductors designed for high power handling and minimal low-frequency distortion. The AUX-0025 is a two-channel passive filter, with a 20 Hz to 20 kHz passband. It is designed to be used with two-channel analyzers, including the APx555, APx52x Series and 2700 Series test systems. The AUX-0040 is a two-channel passive filter, with a 20 Hz to 40 kHz passband. It is designed to be used with two-channel analyzers, including the APx555, APx52x Series and 2700 Series test systems. The AUX-0100 is an eight-channel passive low-pass filter, with a 20 Hz to 20 kHz passband. It is designed for use with the APx58x Series audio analyzers. Manufacturers of power amplifiers are moving to switching designs (also called Class D or switch-mode) to make their amplifiers lower cost and more efficient compared to conventional linear power amplifier designs. This technology has particular appeal in automotive and personal stereo applications where efficiency, low battery consumption, small size, and low cost are desired. However, amplifiers using this technology present new measurement challenges. The switching process adds fast rising edges at the switching frequency to the audio output signal. 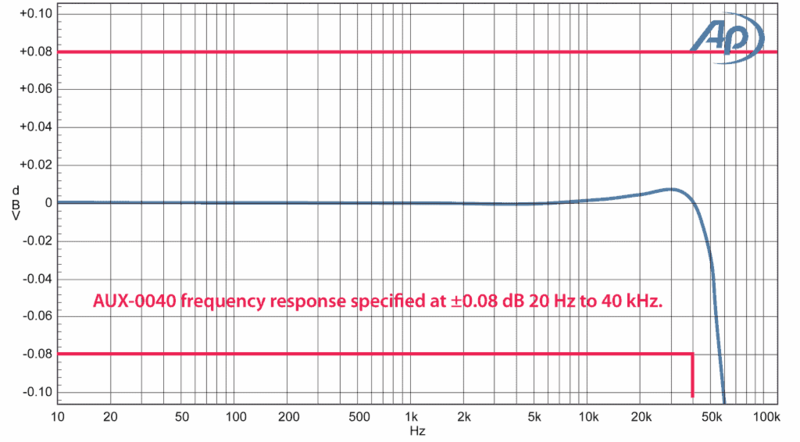 These fast edges are of no consequence to the typical load (a loudspeaker), but present a difficult signal for measurement instruments. 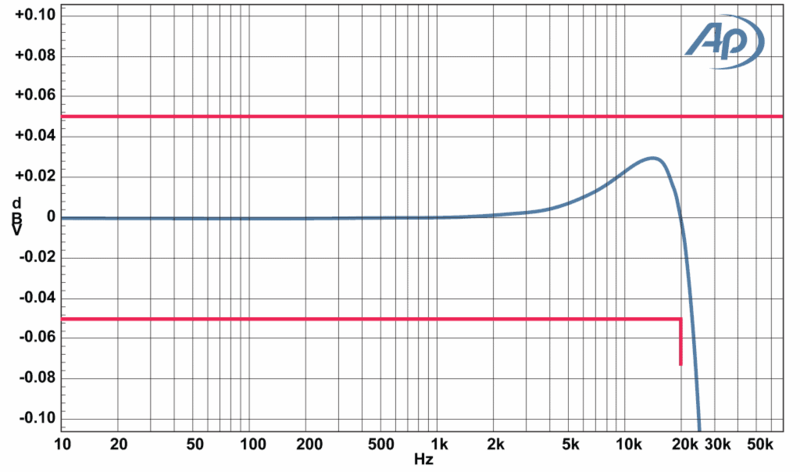 The fast switching edges present high energy content and will introduce slew rate limiting when presented to the input stage of most measurement instruments. When stressed by these fast edges, the analyzer input amplifier will usually slew rate limit and will not be able to function effectively in its normal mode. Auto ranging will be affected and the signal under test will be misrepresented to the following measurement circuits. The result is that noise and distortion measurements of switching amplifiers with almost any analyzer without preconditioning will yield inaccurate and unpredictable results. The solution to this problem is to precondition the signal before presentation to the analyzer. The way to do this is in the form of a low pass filter that will soften the fast edges while passing the primary audio signal intact. The best approach to this filter is a passive design, as it will handle the fast edges properly, is relatively low cost, and will not require power. A well-designed passive filter will also not compromise the audio signal passing through it by adding noise or distortion as an active design might.